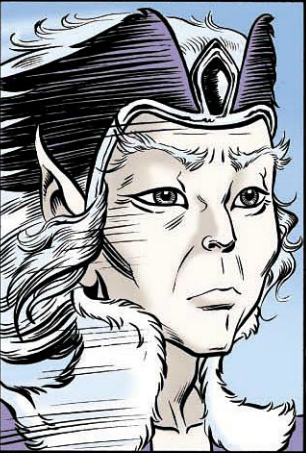 Voll is a firstborn of the High Ones and the Lord of the Gliders of Blue Mountain. A natural leader, he had a vision for a better life for his band of elfin refugees on the World of Two Moons. He dreamed of returning to the Palace of the High Ones, but it had been buried under a glacier. Though not all heeded his warnings about how the magic-dampening world would change them, he ultimately led many to the safety of a large, lonely peak known as Blue Mountain. If it hurt his pride that some of his people, like the powerful rock-shaper Yurek, rejected his idea and splintered off on their own, he took comfort in the fact that those who did follow him would be eternally safe, and that his lovemate and staunchest supporter Winnowill stood faithfully by his side. Under his paternal leadership, his followers thrived. Free from the dangers of predators, weather and even humans in their mountain fortress, they focusing on honing their magic powers. Many were rock-shapers, who hollowed out Blue Mountain and set about recreating the Palace from remembered stories of their firstcomer parents and grandparents. Most were floaters, and in time, they tamed the giant hawks that used the mountaintop as their aerie and became known as the Gliders. Voll rewarded his strongest floaters by appointing them to the elite group of bird-riding hunters he named his Chosen Eight, through whom he fed his people. For millennia, the Gliders lived in unchanging safety. Yet in time, a creeping stagnation set upon them as they focused more and more of their thoughts and powers inward, making Blue Mountain’s interior and even their clothing and art more and more elaborate. Some even stopped active life altogether and became statue-like beings focused on one unchanging task. In their stagnation, the Gliders eventually stopped experiencing Recognition and new births altogether, and Lord Voll sunk into melancholia and apathy, living more in his dreams and memories than in the moment. Winnowill ruled from behind the throne in Voll’s name. When the Chosen Eight captured the Wolfriders after they slew one of the giant hawks, it was the first time in centuries that anything new happened inside the mountain. The presence of the feral forest tribe, particularly that of their children, sparked Voll back to life and reignited his old dream of returning to and reclaiming the Palace. When the Wolfriders revealed the Preserver Petalwing to Voll, it shocked the aged lord out of his final lethargy and fired him with the desire to seek their ancestral home. While he led the Wolfriders and several of his own people on a grand quest to rediscover the Palace, Voll died at the hands of Guttlekraw’s guards before he could fulfill his mission. Yet his spirit, freed from its physical shell, finished the journey and took up residence in the Palace.